not Survivors of the HOLOCAUST. A drop of water hitting the surface of the ocean sends rings of energy out from its epicenter. So too humanity’s cry for peace, peace and safety moves out from ground zero, the earth…. and echoes throughout the universe. 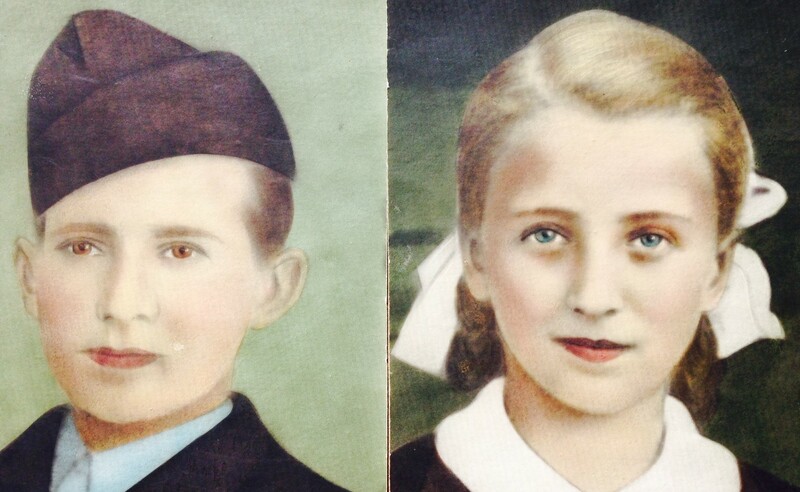 The lives of my mother and father, along with many relatives, all Holocaust victims have now passed on. The narratives of their lives have been planted into my memory. All their life stories, their joys and sorrows are now mine. Their stories like plants in the soil have become rooted deep inside my mind and the only water I have to keep them alive are my tears. Emotionally their burdens are now my burdens because their lives now form the foundation of my life. In life they boldly referred to themselves as Survivors because they came through the most horrifying experience that any human being could possibly live through. In the death camps they were nothing more than livestock penned behind barbed wire. Many carried the number of their brand on their flesh. “I knew you even before you were conceived. Upon gaining freedom, they all began a new life. On the outside they were brave, but in the shadows of their minds a vortex of Un-answered questions whirled round and round. Their cries and prayers seemed to rise up to deaf ears as they experienced the Silence of God. Answers never came. Locked within their forever broken hearts were deep longings and unfulfilled love for fathers, mothers, children, relatives and friends. The lives of those they loved were now gone like a wisp of smoke in a gentle breeze. Afterwards for the most part they put up brave fronts. Life after all was for the living not the dead. They were wrong… for the dead make up the living. They were not Survivors, but broken VICTIMS of the Holocaust. Their voices joined the voices from the ancient past of those who had gone before them. Looking back through the Veil of time we know the ancient ones also cried to the heavens but only heard back the empty echoes of their own voices… and the Silence of God. Mankind and sometimes believers like you and I have forgotten that disobeying God brings trials and testing accompanied by the consequences of sorrow and pain. For God will use hammer blows on an anvil and fire to purify us, in order to keep us on the narrow path home to HIM. But most of all He reminds us this life is not ours, nor about us, but about HIS SON YESHUA who died for us on the CROSS; so, we might have Eternal Life instead of Eternal Death! A drop of water hitting the surface of the ocean sends rings of energy out from its epicenter. So too humanity’s cry for peace, peace and safety moves out from ground zero, the earth…. and echo’s throughout the universe. In life they boldly referred to themselves as Survivors, because they came through the most horrifying experience that any human being could possibly live through. In the death camps they were nothing more than livestock penned behind barbed wire. Many carried the number of their brand on their flesh. Afterwards for the most part they put up brave fronts. Life after all was for the living not the dead. They were wrong… for the dead make up the living. They were not Survivors, but broken VICTIMS of the Holocaust. Their voices joined the voices from the ancient past of those who had gone before them. Looking back through the Veil of time we know the ancient ones also cried to the heavens but only heard back the empty echo’s of their own voices… and the Silence of God. But most of all HE reminds us this life is not ours, nor about us, but about HIM! Who died in the HOLOCAUST or SURVIVED. The clouds of war blocked the sun over Europe. Evil given permission by God was now going to have its day. This day of shadows was to last 4 years. The master planner of this horror, satan, was going to get his fill of souls for a short time. For satan, like an unruly dog is on a leash, held by the Hand of Almighty God. During this time satan would destroy millions upon millions of people branded by Hitler unfit to live; including 6 million Jews. Many Jews in the thousands escaped by leaving Europe in the years before the doors were shut. But not my parents. They could not believe nor envision the evil that human beings with black hearts were capable of doing to their own kind. And so they stayed, and were ensnared. They not only lost things they cherished, but the precious lives of loved ones. Armin and Margaret my parents were never the same. My mother lost her entire family; my father lost his wife and two children. Teddy, a boy, was nine years old and had deep chocolate eyes. Lillian, a girl, was eleven years old with eyes the color of the sky and hair like wheat in the sunlight. After the war was over both my parents were re-united in the immigration camp. My father formerly my mother’s brother-in-law, and my mother formerly the sister of my father’s wife. It took 2 years for them to regain their health. They married in the camp and I was born in the camp in 1947. Their mutual loses drew them together into a marriage built on a foundation of pain and suffering. But God in His Mercy brought them comfort in each other and blessed them with me; a new life to cherish into the future. In the case of my father the people occupying his home allowed him to go into the backyard and dig up a box that he had hidden in the earth. A box filled with treasures, jewelry, and money. These things had no value to him…but the pictures…OH Dear God, the pictures…the images of love and life lost; he gently held close to his heart and brought them with him. Armin had walked his own “Via Delarosa”; his road of suffering. At its end he found only misty memories of the past. He had lived through hell on earth just to be able to touch the hands of his children and hold his wife once again. But they …were no more. His hands shook and all the pent up anguish came out in great sobs and tears as he held 3 pictures of 3 hearts gently against his breast…Teddy, Lillian and the only remaining picture of his wife as they stood bride and groom together looking forward to a bright future. And so he walked forward into a new life clutching the old life…crying out to God…WHY? but only hearing the sound of silence. He never understood till his dying day that it was satan who robbed him…not God. Teddy and Lillian died a horrible death. Their mother stood with the two of them clutching each other among a packed room of strangers. They were all naked in a shower room. There was silence as they all heard the hissing sound together at the same time. No water came forth, just the sound of gas, then the sound of choking, then the screams of pain from their eyes and the burning in their lungs. They clung together Lillian, Teddy and their mother. They fell together with the rest of the people. And they were buried together in a mass unmarked grave. Teddy and Lillian live today in heaven before their Lord. No more tears for the Lord has wiped them from their eyes. They wait patiently for me in Heaven to come to them and I look eagerly to that day of reunion. I have one more sibling that died young; to be exact after 4 months of life. My Aunt Bella a strong willed woman ruled this family of immigrants here in Detroit. One day Bella came by and took my mother for a ride to her son’s business. My mother was not feeling well; she seemed to have gained some weight. My mother never recovered mentally from her experience in the camps. She was timid, shy, meek and quiet. My father was not home at the time. And so Aunt Bella took my mother to her son the doctor. He was a very prominent doctor, so prominent that he specialized doing favors for the Jewish mob in Detroit. The favors were abortions for their daughters when they became pregnant. So it happened that two heartless people teamed together to bring an unsuspecting woman onto an examination table and then proceed to abort, to murder my sister. She too cried out in agony, the silent scream from my mother’s womb that only God could hear.I learned of this a few months after the death of my mother when I was in my thirties. My father, very ill himself needed to confess this atrocity that he kept hidden in his heart for years. Aunt Bella died a forgotten old woman alone; she took her own life with an overdose of sleeping pills. Her son while butchering an unborn child in the womb of his crime bosses daughter, made an error and she died. He ended up in prison. One year later he was found in his cell with a rope around his neck, hanging from the ceiling. Yes my sister with no name died a horrible death within the womb of my mother at the age of 4 months. The one with no name was cheated out of life and I was cheated out of knowing her, just as I was cheated out of knowing Teddy and Lillian. But all three are alive waiting in HEAVEN for me to finally come home. JESUS will watch as the 4 of us embrace and wipe the tears of Joy from each other’s eyes. If you have a child that has died; please know that JESUS made it clear in the Bible that ALL Children who die go immediately to Heaven. I too will be in heaven for our reunion because I looked upon HIM Whom I Pierced and said Lord Forgive Me…and JESUS DID. I am a Messianic Jew who lost most of his family in Hitler’s Holocaust. The slogan Never Again. At Least Not on My Watch, regarding the Holocaust…will not stand! The Lord allowed Hitler’s Holocaust to happen to HIS Chosen people to purify the Remnant so they would seek the Truth about HIS Son Jesus their Messiah in the Old Testament Messianic Prophecies. There is another Holocaust coming for the Nation of Israel where God allows 2/3rds of the Jews to die in their Sins and only 1/3rd (those that will “look upon HIM whom they have pierced”) will recognize Jesus and be saved. Zechariah 12-13:8. There is also coming a Believers (Jew and Christian) Holocaust described in Revelation 7:9-17. Yet the word Holocaust does not only apply to the Jews & Christians. GOD destroyed all but 8 people out of all human beings that existed before the flood. I would consider that to be a greater Holocaust wouldn’t you? But the greatest Holocaust is the hidden Holocaust throughout time of the multitude of unsaved Sinners that we cannot count…who will exist in Hell forever. Are you sharing the Gospel with those you love or are you letting them continue on their journey to the Pit? The Messiah is not the possession of any people group. JESUS is the Messiah / Savior of ALL people who will Believe in HIM and HIS CROSS and reach up to take HIS Hand. Who WILL Stop Jewish Anti-Semitism?